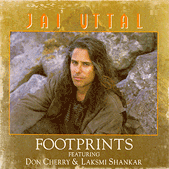 Jai Uttal strikes an amicable balance between richly exotic Indian textures, jazz improvisation and electronic invention on his debut release, Footprints (Triloka). The San Francisco-based artist’s approach is both skillful and accessible. Synthesizers, electric and midi guitars, samplers and bass mesh with the sounds of tabla, harmonium, percussion and the six-stringed dotar. Visions of snake charmers, village dances, intimate court performances and wandering street singers fill this album with a profound sense of appreciation for India’s musical legacy.